Because the article system is so complex and often idiosyncratic, it is especially difficult for non-native English speakers to master. This handout explains three basic rules that are the foundation of the article system and two basic questions that will help you choose the correct article in your writing. It provides examples of articles being used in context, and it ends with a section on special considerations for nouns in academic writing. First, this handout will be most effective if you use it as a tool. Every time you read this handout, read it along side another piece of writing (a journal article, a magazine, a web page, a novel, a text book, etc.). Locate a few nouns in the reading, and use the handout to analyze the article usage. If you practice a little bit at a time, this kind of analysis can help you develop a natural sensitivity to this complex system. Second, using articles correctly is a skill that develops over time through lots of reading, writing, speaking and listening. Think about the rules in this handout, but also try to pay attention to how articles are being used in the language around you. Simply paying attention can also help you develop a natural sensitivity to this complex system. Finally, although using the wrong article may distract a reader’s attention, it usually does not prevent the reader from understanding your meaning. So be patient with yourself as you learn. Rule # 3: The choice of article depends upon the noun and the context. This will be explained more fully below. Your answers to these questions will usually determine the correct article choice, and the following sections will show you how. Temperature is measured in degrees. Volcanoes are formed by pressure under the earth’s surface. Quagga zebras were hunted to extinction. The computer is a marvelous invention. The elephant lives in family groups. Note: We use this form (the + singular) most often in technical and scientific writing to generalize about classes of animals, body organs, plants, musical instruments, and complex inventions. We do not use this form for simple inanimate objects, like books or coat racks. For these objects, use (Ø + plural). A doctor is a highly educated person. Generally speaking, a doctor also has tremendous earning potential. You’ll probably find generic references most often in the introduction and conclusion sections and at the beginning of a paragraph that introduces a new topic. Non-count nouns = no article (Ø) a. Our science class mixed boric acid with water today. We serve bread and water on weekends. Plural nouns = no article (Ø) a. We’re happy when people bring cookies! We need volunteers to help with community events. Singular nouns = a/an a. Bring an umbrella if it looks like rain. You’ll need a visa to stay for more than ninety days. Exception: “A few of” does not fit this category. See Number 8 in the next section for the correct usage of this expression. Introducing a noun to the reader for the first time (also called “first mention”). Use “the” for each subsequent reference to that noun if you mean “this one exactly.” Example: I presented a paper last month, and my advisor wants me to turn the paper into an article. If I can get the article written this semester, I can take a break after that! I really need a break! Note: The writer does not change from “a break” to “the break” with the second mention because she is not referring to one break in particular (“this break exactly”). It’s indefinite—any break will be fine!! My research will be conducted in Luxembourg. Dr. Homer inspired my interest in Ontario. Note: Some proper nouns do require “the.” See the special notes on nouns below. Step two: mix the water with the boric acid. The laughter of my children is contagious. We recruited the nurses from General Hospital. The projects described in your proposal will be fully funded. Bring the umbrella in my closet if it looks like rain. Did you get the visa you applied for? The boss just asked about the report. Meet me in the parking lot after the show. I found a good handout on English articles. The handout is available online. You can get a giant ice cream cone downtown. If you can eat the cone in five seconds, you get another one free. Study the chapter on osmosis for the test tomorrow. Also study the notes you took at the lecture that Dr. Science gave yesterday. For the more visually oriented, this flowchart sketches out the basic rules and basic questions. “Research” and “information” are good examples of nouns that are non-count in American English but countable in other languages and other varieties of English. Strategy: Check a dictionary. A learner’s dictionary will indicate whether the noun is countable or not. A regular dictionary will give a plural form if the noun is countable. Note: Some nouns have both count and non-count meanings Some nouns have both count and non-count meanings in everyday usage. Some non-count nouns have count meanings only for specialists in a particular field who consider distinct varieties of something that an average person would not differentiate. 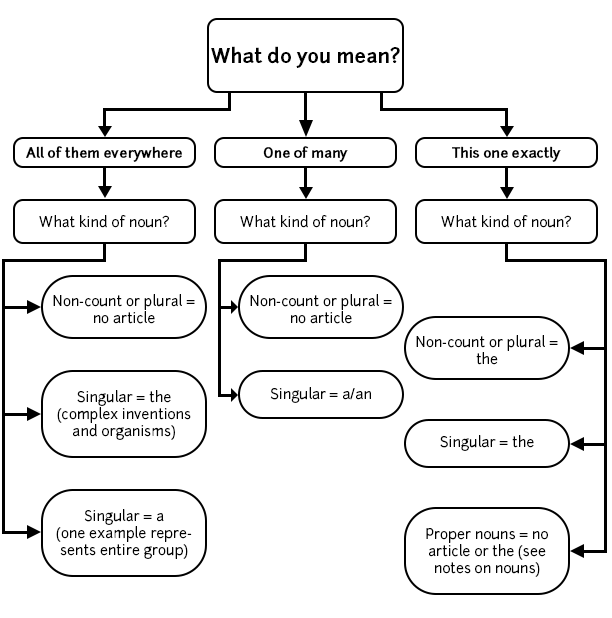 Non-count meanings follow the rules for non-count nouns (generic and indefinite reference: no article; definite: “the”); count meanings follow the count rules (a/an for singular, no article for plural). Can you see the difference between these examples? John’s performance on all three exams was exceptional. John’s performances of Shakespeare were exceptional. To be well educated, you need good instruction. To assemble a complicated machine, you need good instructions. Byrd, Patricia, and Beverly Benson. Problem/Solution: A Reference for ESL Writers. Boston: Heinle & Heinle, 1993. Celce-Murcia, Marianne, and Diane Larsen-Freeman. The Grammar Book: An ESL/EFL Teacher’s Course. 2nd edition. Boston: Heinle & Heinle, 1999. Swales, John, and Christine Feak. Academic Writing for Graduate Students: Essential Skills and Tasks. 3rd edition. Ann Arbor: University of Michigan Press, 2012.